In the stunning art piece by Sawako Utsumi titled Spirit of Shinto and Ukiyo-e in the Light of Nature, you have so many intimate and adorable intricacies. 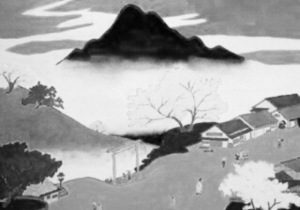 This applies to the rich influence of ukiyo-e during the height of power of this artistic movement, to the continuity of Shintoism that blends naturally with nature. Therefore, the Japanese artist Utsumi focuses on simple themes based on a notable art piece by a master of ukiyo-e. However, she does this based on her own individuality and this equally applies to the color scheme, nature, and the adage of a Shinto priest. The land of Japan is notably shaped by the indigenous faith of Shintoism but Buddhism emerged to be a potent religious center at the heart of this nation. Indeed, powerful religious holy cities including Kyoto, Koyasan, and Nara highlight the power of Buddhism in the land of the rising sun. This reality flowed within Japanese society because of Buddhist priests entering from China and Korea – and because Japanese religious thinkers entered the Middle Kingdom. At the same time, Confucianism impacted heavily during various periods of Japanese society because of the interaction that flowed between China and Japan. Ukiyo-e emerged during the Edo period and continued to flourish during the early era of the Meiji period after the Meiji Restoration of 1868. Yet, the onset of modernity, technology, influence of Western art, new artistic movements, greater options for Japanese citizens – and other factors, meant that ukiyo-e would soon decrease in influence. Despite this, great ukiyo-e artists left behind a rich legacy and influenced various powerful impressionist artists. Utsumi masterly fuses the old artistic world of ukiyo-e with the indigenous faith of Shintoism. Yet, this is done in a simplistic way based on the power of a past master of ukiyo-e. 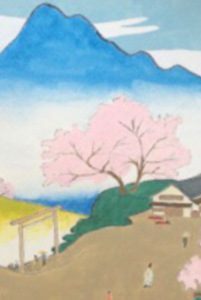 However, like mentioned earlier, Utsumi provides her own unique style whereby the delicate miniature of a Shinto priest is illuminated by the meaning of the art piece. Similarly, the powerful color scheme by Utsumi flows naturally within Shintoism because nature is so powerful in this faith. 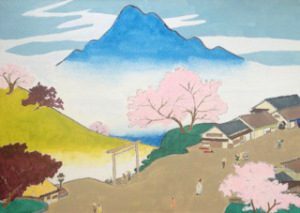 Therefore, this art piece by Utsumi is a firm reminder that not only does the old artistic world still survive the travels of time, but also equally important the soul of Shinto still ticks within the heart of society.